Industrial robots and service robots report strong demand across automotive, electronics, and logistics markets. Japan and China are collaborating on a number of automation initiatives, but how does that affect their geopolitical rivalry? Plus, Germany wants a DARPA-like agency for cybersecurity. Language barriers and culture limitations could be eased through the use of 'robot ambassadors'; construction robots disrupt labor force in some countries while helping others facing shortage of human workers. This week's international AI and robotics roundup looks at the IEEE's show in Singapore, a deal between Germany and China, and Indian drones for fighting disease. Does the German government's reaction to Midea's acquisition of KUKA herald a new era of protectionism? Multinational robotics companies need a georobotics strategy to prepare for such changes. 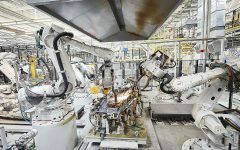 Germany has long been a strong user of industrial automation, but expanding applications, university research, and savvy PR are helping maintain German robotics leadership.